The important lesson of the $8 hospital bypass bill of Khaw Boon Wan in 2011 is to buy additional medical insurance coverage like, free riders. However, free riders are not free, you need to use medisave or cash to buy it. And, in many ways, the ability to use extra money to purchase free riders also reflects your socioeconomic class. MediShield Life is sized for subsidised treatment in public hospitals. Those who choose to stay in a Class A/B1 wards or in a private hospital are also covered by MediShield Life. However, as MediShield Life payouts are pegged at Class B2/C wards, the MediShield Life payout will make up a small proportion of the bill only. The patient may therefore need to pay more of their bill from Medisave and/or cash. If you plan to use Class A/B1 wards in the public hospital or go to a private hospital for your future hospitalisations, you may also wish to consider purchasing Medisave-approved private Integrated Shield Plans (IPs). IPs are made up of two components – MediShield Life and additional private insurance coverage providing additional benefits and coverage (e.g. to cover the costs of private hospitals or Class A/B1 wards in the public hospitals). MediShield Life is a co-payment system even with government subsidies. The only way to avoid co-payment and enjoy $0 hospital bill is to purchase IPs with free riders. It means you have to pay extra either using medisave or cash as there is a cap on medisave usessage. This is in fact a financial risk management. What risk? Sick and illness are unpredictable, for example, there is a need to upgrade to Class B1/A wards because of the long wait at the emergency department or there is a need to choose a specialist to do the operation. Or, people just want go to private hospitals for better and faster treatment. There is a big difference in financial commitment with or without free riders/IPs in the case of the upgrading of wards. Medishield Life is a basic medical insurance for lower and middle socioeconomic class. With lower medisave contribution and lower cash position, it means a lower financial mean to purchase free riders. However, if one is forced to upgrade for whatever reason, he or she will be in a losing position as compared to someone who has purchased free riders or IPs. The premium for free riders or IPs will protect the buyers for higher hospital bills and co-payment. Lower socioeconomic class people will suffer a lot by just doing an upgrade. A situation similar to “rich getting richer, poor getting poorer”. Free rider is not free even medisave is used. Medisave is your contribution, your money at CPF Board. For high socioeconomic class people, they make more contribution and so they are likely to purchase free riders and IPs (upgrade to even private hospitals). They can also afford to pay cash for free raider premium. Free riders can help them to pay for big hospital bill, like the case of $8 heart bypass operation. Khaw and other ministers are high income earners and they also know the financial risk if they are hospitalised. They can even buy free riders for their children and loved ones. Not all CPF members buy free riders or IPs. For those who do not buy these additional insurance, they will have to face the financial risk of having to pay more if they decide to upgrade to higher class wards. However, for medical industry, the practice is to go for market rate whether patients buy free riders or IPs or not. For those people who have no IPs or free riders, for financial risk consideration, staying at Class C/B2 wards is the best option. Even after government subsidy, they still need to pay the co-payment. Not only medical professionals have this “free riders” mindset, patients who buy free riders insurance also want to make use of this advantage of zero copayment insurance. This creates a biased situation that those cannot afford and unwilling to buy free riders end up losing out. These group of people, most likely lower socioeconomic class, in fact, are helping to keep the medical cost down but may end up paying the most, even with subsidy, especially in the case that they need to upgrade to higher class. There is no surprise the Singapore Medical Council has to issue a reminder to keep costs down. Do you think the 5% co-payment for new IPs will work? In fact, medical insurance and free riders can also be an indicator for socioeconomic class - whether you can afford to purchase free riders and IPs or not. Lower socioeconomic class seems to indicate low class people as shown in the debate of the controversy secondary school guide book. In ancient China, there are two famous philosophers, Mozi and Zhuangzi, who are well known for their lower socioeconomic class. They dress poorly and have no money. When Zhuangzi went to meet King LiangHui. The King commented on Zhuangzi’s poor. However, Zhuangzi replied he was materials and assets poor but spirit high. Low Thia Khiang made a “cogent and balanced” speech during the Budget debate. However, what are the real challenges that Low is trying to tell Singaporeans, especially the lack of Mandarin policy? On Singapore’s interest and perspectives, we have only one option for the future - the western style open, transparency and accountability governance. Our command and standard of Chinese language goes from bad to worst. There are too many mistakes and wrong translations, wrong interpretations in public. In recent years, Singapore’s reputation in China has turned from reliable to doubtful. 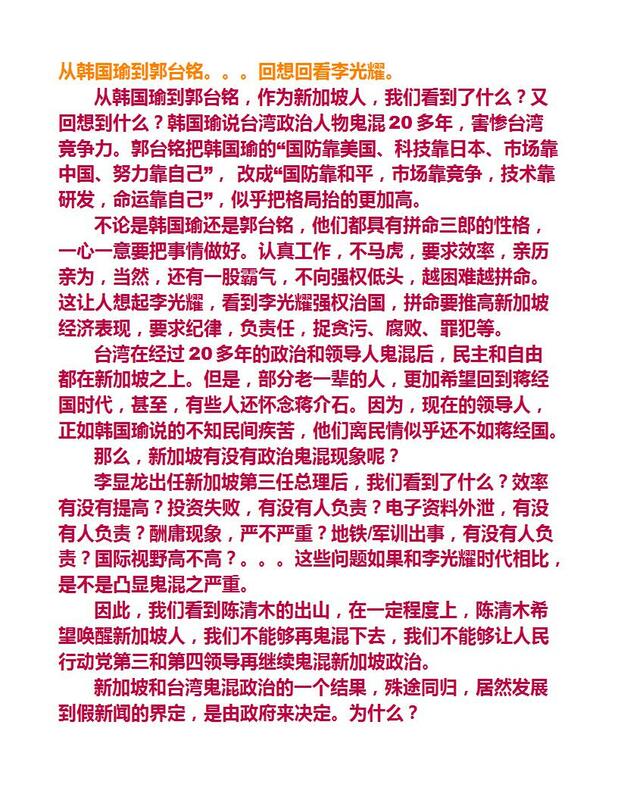 In Chinese social media, there even have hate speeches against Singapore. Among local population, we have also developed the dislikes of Chinese, Indians and other foreigners. However, these are the places that promise opportunities for Singapore. Kinship development moves from traditional Chinese Singaporeans to newly arrived Chinese from all over China. Low did not point out the unfavourable trends but it is a fact that we have almost lost all Chinese cultural DNA. Even there is Chinese century or (later) Indian century, how can Singaporeans benefit from it with our half-past-six language ability? How can we stay relevant and be useful? Low suggests learning Mandarin (and perhaps dialects) as an overall strategy for Singapore. It is really too late, too challenging for Singapore as our children have developed a mindset of “hate Chinese”, look-down attitude, and English is my mother tongue. This, perhaps, is the trade-off and price for being a multiracial and multicultural city state. While a common language can create utility returns, better productivity and efficiency. When you gain some, you also lose some. We gain from productivity but we lose our cultural DNA. Facing the Chinese challenge, and trying to project a common ground within Singapore, Lee conveniently picks up a point that indicating Low also agrees with his foreign policy towards China. Lee wants to create a united front that his foreign policy is supported by the oppositions too. Lee is too happy to hear Low’s comment on China: Will China seek to turn the tables on its experience of European imperialism and become an imperialist power itself? It is not clear Lee is using this opportunity to tell the Chinese or Singaporeans. Lee intentionally avoids the Mandarin issue. Under his charge, from the promotion of Chinese B to bad translation and sub-standard Mandarin, Singapore’s Chinese strength and cultural DNA has reached a point of no return. Without proficient Mandarin, how can we benefit from the rise of China? How can we develop kinship with China? Our better connections with the world, whether trade or finance, technology or environment planning, are losing comparative advantage when China further open up their market for the world. In Global-Asia, Singapore will continue to be a multiracial and multi-lingual city. English will continue to be our first language. Our institutions will remain a western based philosophy. It is impossible for us to have a strong Chinese cultural DNA, tradition and even kinship. This means to stay competitive Singapore must follow the successful examples of western cities, be it Seattle, London, New York, Boston, Berlin or Sydney. The governments must open for discussion, transparent and accountable. The society and community must highly involved in all important decision makings. The recent debate between Workers’ Party and PAP about the GST timing and suspicions is a backward development for any advance and successful city. The PAP wants to restrict discussion and debate based on their own agenda. They do not allow suspicions and always use credibility as an excuse for discussion or defamation. Like our first-mover advantage in China, we now need to think and come out with a new strategy to engage China. The PAP too has lost their first-mover advantage in Singapore and must also come to the reality that open debate and discussion, whether inside or outside Parliament, is good for Singapore. Otherwise, the ministers will find only debating among themselves! If the PAP continues to use the strategies of the past to engage Singaporeans and the oppositions, Singapore will find no way to be relevant in the world, Global-Asia or belt and road. New ideas, technology, solutions are appearing everyday. It is impossible to know all these developments and so we need to engage more people to widen our knowledge base. The GST suspicion debate also let us see the quality of PAP 4G ministers, are they any better than the oppositions? Sadly. PAP fails to produce future leaders for Singapore.